A modern chess board is always the standard 8 square by 8 square board with alternating dark and light squares. Place the board between the two players. The square in the lower right-hand corner should be a light-colored square. If it's not, rotate the board. An easy way to remember this rule is the phrase "white on right." Some chess boards have letters across the top and bottom, denoting the ranks, which are the rows that go from side to side across the chessboard. These boards will also have numbers going up and down the sides of the board to identify the rows that go from top to bottom, called the files. Many different types of chess pieces have been used throughout history and different parts of the world. Some variations include Chaturanga, played in ancient India, and Shogi played in Japan. Chess pieces have represented a wide range of characters, from wise advisors to animals to warriors. Originally conceived of as a field of battle, the symbolic meaning of the game changed as it gained popularity in Europe, and the pieces became stand-ins for a royal court instead of an army. Thus, the original chessmen, known as counselor, infantry, cavalry, elephants, and chariots, became the queen, pawn, knight, bishop, and rook, respectively. By the 19th century, chess clubs and competitions began to appear all around the world, it became necessary to use a standardized set that would enable players from different cultures to compete without getting confused. If you are setting up a contemporary chess board, you will need to have 16 pieces of each color. While white and black are standard, there are many variations with colors and styles. Every chess set includes all of these pieces, even if they are fashioned in a different style. Before setting up your pieces, spend a few minutes identifying the pieces in your particular set. Put the rooks, which in most sets look like small towers, in the four corner squares of the board. If your board has ranks and files labeled, place the white rooks on the corners of the first rank and the black rooks on the corners of the eighth rank. Place the knights, which usually look like a horse's head, next to the rooks of the same color. The bishops are placed next to the knights of the same color. Bishops often look like an ornamental hat, but again, this varies widely based on the set. The queen is usually the second-tallest piece in a chess set. Place the queen in the center square of its color. The white queen is placed on the lighter center square while the black queen is placed on the darker center square. A good way of remembering this is "queen on color." If your board has coordinates, the queens should both be on the d-file. Many sets include a second queen of each color. This is kept to the side, and used when a player advances a pawn across the board and "Queens," or exchanges that pawn for another queen. The king is usually the tallest piece in a chess set and typically has a cross on its head. Each king should be placed next to the queen of the same color. If your board has coordinates, the kings would be on the e-file. The pawns are the shortest and most numerous pieces in a chess set; there are eight pawns of each color. 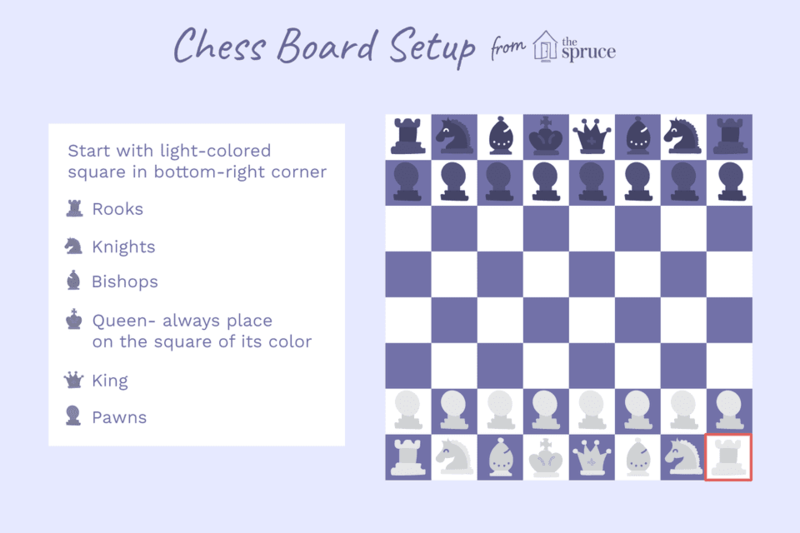 Place the pawns in each square in the row in front of the other pieces of the same color. If your board has coordinates, the white pawns should be on the second rank, and the black pawns should be on the seventh rank. Once your pieces are set up, you're ready to start the game. Typically the player with the white pieces starts the game. This is merely a convention and not a strategy for winning the game, as the rules of chess have been tweaked over the years to be sure neither player has a built-in advantage. In addition to your board and chess pieces, you may wish to have a timer. Some chess sets include a small hourglass or timing clock. Timers are important if you are playing competitive chess or if you want to keep the game moving forward at a reasonable speed.